Moving from MZ-Tools 3.0 to 8.0 Part 12: Headers for all code elements. With one click. Another area that has been revamped for MZ-Tools 8.0 is the headers for methods, classes, etc. 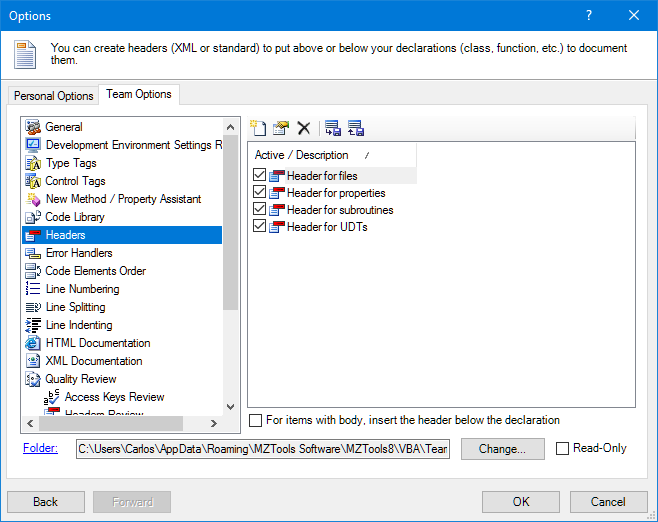 In MZ-Tools 8.0 the feature is named Headers, and applies to any “code element” such as a class, module, interface, user-defined type (UDT), event, field, constant, enum, property, method, etc. That is, anything that may deserve a header to explain its purpose. In contrast, MZ-Tools 3.0 only allowed headers for files and for procedures. That feature goes through all files detecting which code elements lack a header and inserts the correct one. It’s a super-fast way to document all the code elements of a project. But that’s not all, in the next post we will talk about a related feature, the Review Headers.